Toss cabbage, carrots, and shredded pineapple in a large bowl. In food processor (or possibly a blender), process diced pineapple, ginger, and garlic until a fine mash, about two minutes. Add red pepper, white pepper, vinegars, and plenty of salt, then process to combine thoroughly. While running, slowly drizzle in oil to build an emulsion. Pour pineapple sauce over the cabbage mixture and toss to combine. Store in refrigerator for at least several hours, up to over night. 1. Pre-heat oil in a narrow, tall sauce pot (or deep fryer) to about 325-350 degrees. I don’t usually check with a thermometer, but use the wood dowel technique (check for bubbling). 2. 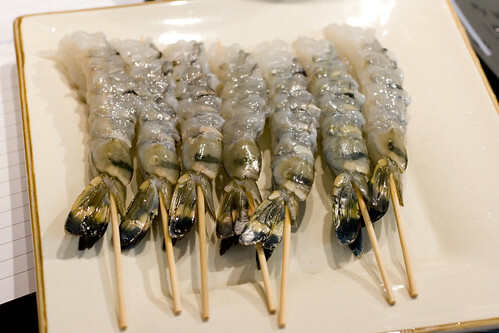 Skewer each prawn with a short, thin skewer. Make sure to keep the prawn perfectly straight. 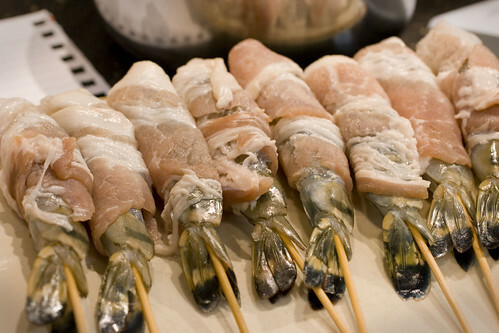 Cut a section of pounded bacon to wrap the prawn with just 1/4 inch of overlap. Don’t cover the tail. 3. Pour panko into a semi-flat bowl. In a similar, separate bowl, whip egg whites until very frothy. Dip each skewer first into the egg whites and coat well, then into the panko, and coat well. 4. Fry a few at a time for about 2-3 minutes, until golden brown. Then drain excess oil on a paper towel. 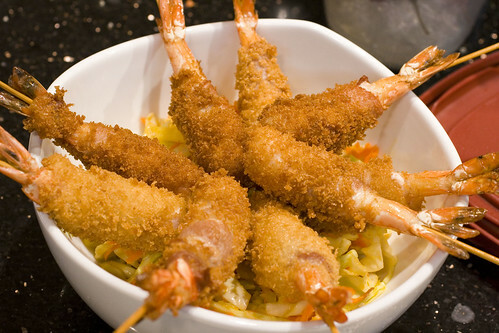 To serve, fill a large bowl with the slaw and rest the hot prawns on top. Advise your diners to eat the two together. posted by Lon	at 10:48 AM	Filed under Fusion, Recipes. You can follow any responses to this entry through the RSS 2.0 feed. Both comments and pings are currently closed. Those are pretty prawns! Huge and gorgeous. The slaw just sounds really fresh and fruity with a bit of bite from the ginger. Pearl – Well, some think prawn are fresh water and shrimp are salt water, but since species are known to live in both, that doesn’t work. Biologists, however, indicate that prawn are a different species that are best indicated by the types of gills. 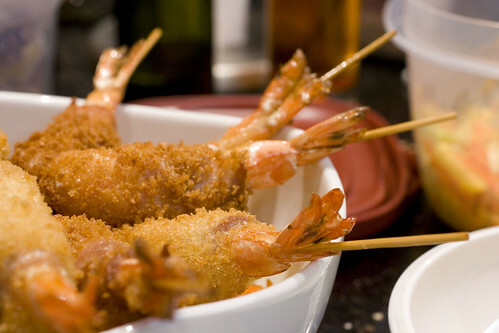 Shrimp have plate-like gills and prawn have furry, branch-like gills. That said, in the food world, it is widely accepted that any large shrimp-like creature may be called a prawn, without much backlash, typically U15 or larger (these were just a touch smaller, but are actually prawn). If they’re really big, or actually small lobster (another common mistake), they’re referred to as scampi. Eatingfoodboy – Well, the term derives from Coleslaw, which is any salad made of shredded cabbage. However, Jessica and I think that any cold salad of shredded ingredients can be called a slaw safely. Also, we think of them as side dishes, never main salads. Eatingfoodboy, when are you going to come to NY and eat with your cousin frosty. I ask because I will likely be able to tag along. I’m Justin, and I ate this. 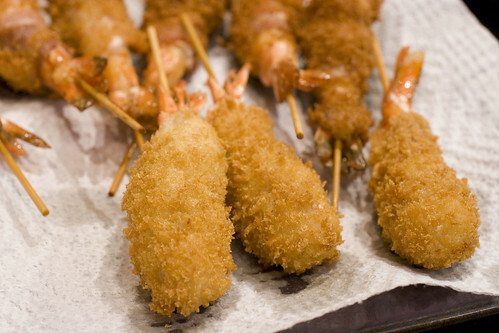 These look super delicious, perfectly fried. I love the slaw, it works really well with prawns.